Why are dads just so hard to buy for? Ditch the jocks, socks and ho-hum gift cards this Father’s Day. Give your dad one of our Fathers Day Gift Hampers guaranteed to make his day (and every day he opens another gourmet treat!) 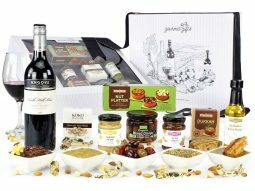 Australian Gourmet Gift Hampers are filled with premium wine, premium beer, and delectable gourmet treats sure to delight the most discerning of dads. Choose from a range of hampers based around his favourite tipples, such as the Premium Beer and Wine Hamper or the Penfolds 389 Baby Grange Hamper. Think out-of-the-box (or basket!) this Fathers Day! Choose a Fathers Day gift hamper that is personalised and meaningful – one that he’ll adore – bite after bite! When your gift hamper has only premium delicacies and a heartfelt card from you, you’re giving your dad something truly special. Fathers Day gifts don’t have to be hard; they can be gooey and creamy and rather good on a little ice-cream! Spoil Dad on Father’s Day; show your dad he deserves the best with a gourmet gift basket from Australian Gourmet Gifts. Your dad gets a bottle of full-bodied red or refreshing beer, or both, marinated olives, tasty snacks and much more. All these luxury items come beautifully packaged (in ‘manly man’ packaging) at an affordable price, delivered free Australia wide. The easiest Fathers Day present you’ll ever buy – we guarantee it! Isn’t it lovely when things are just easy? At Australian Gourmet Gifts, we make buying your dad something he’ll love extra simple. Just choose from our beautiful baskets and then tell us what to put on the card. We’ll do the rest. Guaranteed to make you the favourite child (just kidding, you’re already the favourite). Did you forget about Father’s Day? (Forget that thing we said about being the favourite child…) Good news! Express delivery is available across Australia for a small fee, so Dad will never know you forgot that special Sunday in September! Favourite child status – reinstated! 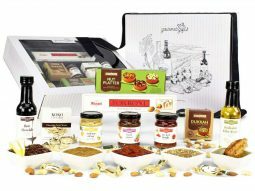 Australian Gourmet Gifts has the right hamper for your dad. If he likes a beer, we’ve got a gourmet hamper for that. If he has a sweet tooth, there’s a hamper for that. Fine champagne – guess what, we’ve got a hamper for that! Or you might want to check out our best sellers above. These are the dad’s day hampers that our customers can’t stop raving about. For the best Father’s Day gifts in Australia, start browsing today! A delicious, affordable Australian Gourmet Gifts hamper is the best way to spoil your dad.